The Columbia and Snake rivers might not have the name recognition of the mighty Mississippi. Yet, with gorgeous mountains, impressive waterfalls, temperate rainforests and wind-swept deserts, the rivers that run between Oregon, Washington and Idaho present some of the Pacific Northwest's best scenery -- and American Empress provides a comfy base from which to explore. Beautiful Victorian-styled ship with friendly crew, quality entertainment and enrichment. Onboard Wi-Fi is slow; cabins have thin walls and outdated bathrooms. Relaxing Pacific Northwest cruise has nice variety of activities onboard and ashore. American Queen Steamboat Company purchased American Empress (formerly Majestic America Line's Empress of the North) in 2013 and completely refurbished the vessel, officially launching it in spring 2014. With 223 passengers, the boat is the largest sailing the rivers of the Pacific Northwest; while American Empress is more accurately described as a steamboat without steam, the iconic red paddlewheel adds an old-timey touch. Decor, too, echoes days of yore, with ornate furniture, floral carpeting, brass, frosted glass lampshades, lace curtains and elegant wallpaper. 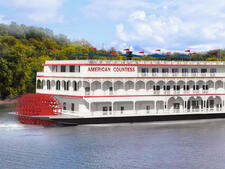 Step onboard, and you'll be transported to a time when steamboats were a regular sight on America's rivers. While the cabins aren't perfect -- the bathrooms and showers are small, and the walls are so thin you can easily hear your neighbors -- the beds are extremely comfy. All rooms have some sort of private veranda, although the ones on the top deck look out onto the walking track. Because the boat visits ports in Washington and Oregon, food and beverages onboard are locally sourced, a real highlight for fans of fresh seafood and craft beer. (The wines are also local but not necessarily as good as they could be.) The food in the boat's two restaurants, the sleek Astoria Dining Room and more contemporary River Grill, is generally tasty, with both simple and more modern preparations. Service not only in the dining room, but in the lounges and bars, is friendly and knowledgeable; the all-American crew make a point to get to know your name and seem to really like being around passengers and each other. Itineraries are designed for passengers who love history, and many excursions are included in the fare. Port towns are small, meaning passengers can explore as part of the included hop-on, hop-off bus tours or on their own by bike or on foot. We particularly liked the daily hikes led by crew entertainers; in Astoria, our walk with drummer Mike turned into an interesting 19,000-step adventure that not only took in the Astoria Column, but went through a hidden rainforest, uncovered the Goonies house and wrapped up with craft beer. Premium options are available for a fee, and they're mostly worth the price (some in the range of about $59 per person) because they bring you to some of the Pacific Northwest's premier sights, such as Multnomah Falls or Mount St. Helens. While most people cruise to see the sights, it's worth noting that American Empress makes a cozy home base, with excellent activities and entertainment. Our riverlorian, Lawrence, gave impassioned lectures, while quirky piano player Frank kept the Paddlewheel Lounge rocking with his New Orleans-inspired repertoire. Trivia sessions and nightly shows were well attended; the boat also honors veterans with a weekly happy hour. The casual atmosphere encouraged mingling, and we saw many new friendships forming. All in all, passengers told us they were on American Empress to relax -- and the cruise certainly delivered. Passengers onboard American Empress are mostly Americans in the 60-plus age range. 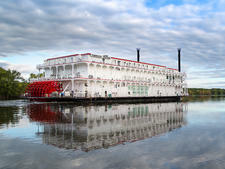 Many have taken cruises on one of American Queen Steamboat Company's boats on the Mississippi and are familiar with the line. On our five-day November itinerary, Californians were well represented. English-speaking international travelers from the U.K. and Australia also make up a small percentage of passengers. While parents and their adult children show up regularly, young families and their children are rare. Dress onboard American Empress is squarely casual. During the day, passengers wear what's comfortable for exploring: jeans, T-shirts, sweaters, sweatshirts, sneakers and rain jackets. (It is, after all, the Pacific Northwest.) The ship will provide umbrellas on rainy days. For dinner, many people stay in the same clothes they wore during the day, particularly for the more popular early seating. Some men change into dress slacks or khakis with button-down or collared shirts and sweaters; jackets and ties are rare. Shorts are not allowed in the main dining room. For women, pants and capris along with casual blouses or sweaters are the norm; we saw few dresses. Formal wear isn't required, as there are no elegant nights onboard. 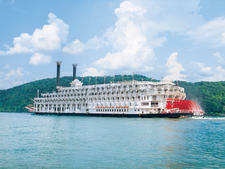 An American Empress fares includes hop-on, hop-off shore excursions in every port; complimentary house wine, beer and soda at lunch and dinner; Wi-Fi (although it's very slow); bottled water in your room and for excursions; and all meals, including specialty dining and room service. Port transfers are not included, but can be purchased. Gratuities are not included in the cruise fares; $17.50 per person, per day, will be automatically charged to passengers' onboard accounts. A 15 percent surcharge is automatically added to all drink purchases. There is no charge for room service, but a tip of $1 or $2 for the delivery is appreciated. Gratuities for tour and excursion operators are not included in the cruise fares and, therefore, are at the discretion of each passenger. The currency onboard is the American dollar.